Russell R. R. Holmes Painted Rock Heliographic Artist of San Luis Obispo, Calif. He did both portraits and view work. 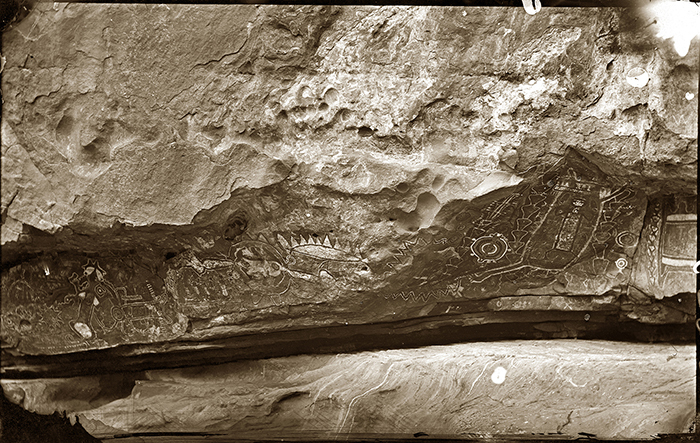 Painted Rock photo said to have been taken in 1876, Chumash rock art on the Carrizo Plain in California. Scanned from the original 5x8 wet plate glass negative by Russell R. R. Holmes. This image is one of three from the original 5x8 wet plate glass negative's by Russell R. R. Holmes. 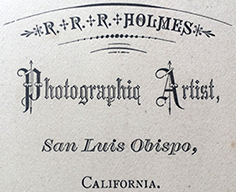 Holdings: over 2,300 Photos by R. J. Arnold in the photo collection. Holdings: over 22,034 Photos of Monterey County listed in our database.